On Sunday, June 2nd, members of the iCarol team will conduct our annual User Group Summit, held just before the start of the Alliance of Information and Referral (AIRS) Training and Education Conference in Atlanta, GA. The User Group Summit provides iCarol customers, and those not yet using iCarol but considering it for their organization, the chance to receive hands on training that will directly benefit service delivery and program administration. Following a number of training sessions held in the morning and early afternoon, the day concludes with a traditional user group session where guests can learn more about our strategy and product plans for the year, provide input on the types of solutions most important and impactful to their agencies, and help prioritize product development with their input on features in stages of consideration, development and implementation. We do ask that regardless of what part of our day you plan to attend, you register for the event so that we can plan accordingly. Registration is open now! Click the button below to learn more and register you and your staff. We look forward to seeing you in Atlanta! 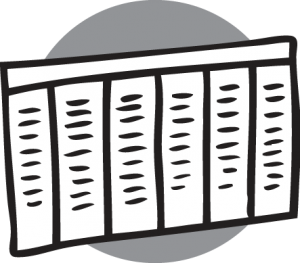 iCarol offers multiple ways for you to retrieve the data you put into your system. 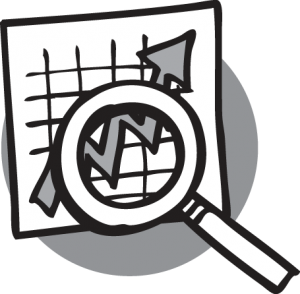 You can use our Statistics area to access dozens of available-on-demand charts and graphs that present information that our clients most commonly need to meet their reporting requirements. 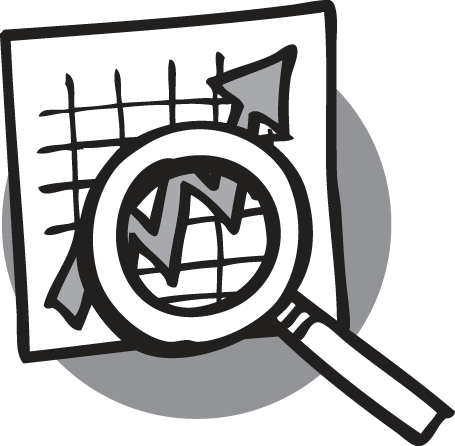 You can also apply numerous filters to these reports, drilling directly in to uncover the desired information. This area is a sufficient source of information for most of your basic reporting needs. But, we understand that others may want or need to run cross tabulations, pivot tables, or otherwise customize their reporting experience a bit further. Our users can extract their raw data files for further analysis in external programs like Microsoft Access or Excel, or simply export the data for offline storage. These data tables contain every last detail about activities like your shifts, volunteer and staff profiles, the records in your resource database, and contact records including the data from contact record text entry fields, among other activities. Our philosophy is this: The data you put into iCarol is YOUR data— we are simply the stewards of it by keeping it stored and protected for you, and so of course you should have access to it as needed. Many of our users choose to go to the Admin Tools area of iCarol to export this data on a regular basis. However, this does require taking a few steps to initiate the download, then waiting for the export to complete before you can begin your analysis. We’ve created an enhancement to the Admin Tools export area: Scheduled Exports. Using this feature, our users can schedule an automatic export to occur. This export can be delivered in your iCarol system just as the manual exports, or you can set a path to a S/FTP that you’ve provided for this data to be delivered to. Each iCarol customer is allotted one free monthly scheduled export to use in their system. This feature is also available as a subscription — you may add on several scheduled exports to your iCarol system for a nominal monthly cost. When you subscribe to this feature, you may choose from multiple time frames for the scheduled exports to occur: Weekly, Monthly, Quarterly, or Annually. If you find yourself needing to export information on a repeat basis throughout your reporting cycles, having these files exported automatically is a convenient and time-saving solution. To add your free monthly scheduled export, log into iCarol and navigate to the Help area to read our detailed Help Articles with step-by-step instructions (simply search for “Scheduled Export”). And, if you want to save even more time and have more exports automatically delivered on a recurring basis, open a case with the Support Team to get started! We’d like to introduce you to an extremely versatile new feature with tons of potential uses: Online Forms. Watch our short video for more information, and contact our support team with questions or to get started with a trial. The truth is that anyone can create a report using all the tools we now have available via the computer. But there are several key areas to focus on if you want to create a report that not only gets a funder’s attention but also results in increased funding opportunities. The report is visually appealing and professional looking — before sending your report out to a funder, have someone who has not seen the report take a look at it and see what their first impression is. Is it a report format that catches someone’s attention? Ask the person reviewing the report to describe their first impression and what words they would use to describe the report format. If the words are not what you would expect (i.e. “wow, this looks really professional and really caught my eye”), spend more time polishing the format. You want your report to be the one that stands out from a stack of many others. Data is displayed in a way that is easy to read and understand — assume your reader does not know your field of expertise so your data has to be presented in a way that makes sense, is easy to follow and does not rely on someone’s knowledge of the field to understand what the data represents. Avoid using acronyms or terminology that someone outside of your field may not understand. Interpret the data for your reader — data alone is powerful but data that includes narrative which explains what the data means, particularly how it relates to what your funder is wanting to know, is more compelling. Data can be interpreted in many different ways, depending on the perspective of who is looking at the data. Be the one to offer the perspective of how the data should be interpreted by telling the story with a narrative. Answer the questions that someone may have in looking at the data so as little as possible is left open to interpretation. Use the tools available to you — Microsoft Word and Excel are your best friends when it comes to report formatting and data display. Use the tools built in with both of these products (or other similar products) to create a report format that gets that “wow” factor. As examples, you can create spreadsheets and charts in Microsoft Excel that are easy to export into Word. A product like Excel is a better tool to use for data display and data accuracy. You can create formulas in Excel to ensure all your totals are accurate. Microsoft Word, on the other hand, is a better product to create your report in as the intent of Word is to allow the user to visually create a document that allows for both data display and narrative formatting. Your report answers the questions your funder is asking — to do this, you need to know your funder and what your funder is wanting to spend money on. Only include the pertinent data and information that will help the funder make their decision. It’s easy to include data and information that we think is important but the intent of your report should be to answer the questions that are important to your funder. As you create and write your reports, always remember that you want your report to be the one that gets a funder’s attention from among many others who may be vying for the same funding that you are. Data tells a story and your report can be the mechanism that explains that story and ultimately leads to increased funding for your agency. Call report exports in iCarol contain a lot of data, and it can be challenging to understand what is being shown or where to find the particular data you are looking for. This article will review how to request a call report export, the different files one receives when they complete a call report export, and what data is shown in these files. To request a call report export, users with Admin security will click Admin Tools, in the left hand menu, then the Tools tab, then the link “Extract all of your data” in the Data Export section. 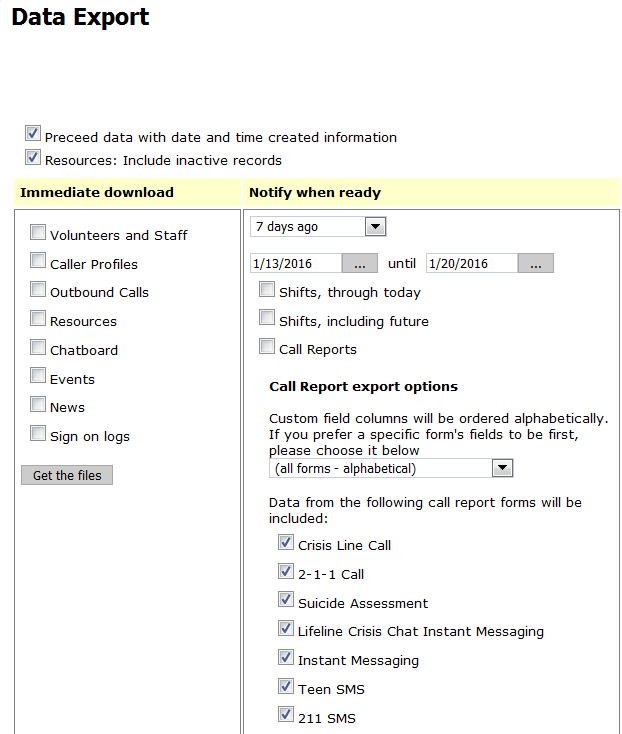 On the data export page, the right hand column will be used to request a call report export. The first drop-down menu, which shows “7 days ago” in the screenshot above, is a quick suggestion list you can use to denote what time frame you want to use for the resource export. If you would like to indicate a specific time frame for the export, use the two date field to denote a start and end date. Next, there are 3 check boxes to indicate what kind of export you would like to request; place a check mark next to “Call Reports”. Under the title “Call Report export options”, you will see some information that says “Custom field columns will be ordered alphabetically. If you prefer a specific form’s fields to be first, please choose it below”. This is referring to the custom categories, groups and field that are in your call report. In the call report export, there will be one column for every custom group in your call report form, and these will be identified in this format: Category Name – Group Name. For example, Demographics – Gender. These columns will be arranged alphabetically by Category name. If your export will contain data from several different call reports, all categories from all call reports will be listed alphabetically. To say this another way, the columns, representing Categories, will not be in the order you see in the call reports, and categories from different call reports will follow each other, instead of all Categories from one call report first, then followed by the second call report, and so on. By choosing a particular call report with this option however, you can have all the categories from that call report come first, in alphabetical order, then followed by all the rest of the categories from all the rest of the call reports. In the next section, you will choose which call reports you would like to export. By default, all call reports in your system are checked. If you would only like to export certain call reports, you will uncheck those you do not want to export. For those clients that only have one call report in their system, you will not see a list of call reports. Finally, to run the call report export, you will click the “Start creating” button, found under the list of call reports. As indicated in the note above the “Start creating” button, you will get an email when the export is ready. At that time, you will return to this page and you will find a link, on the right hand side of the screen, which you will click to download the export files. Usually, exports will be ready in an hour or two, but sometimes will take longer. Exports that contain a lot of data and cover a large period of time will take longer to generate, and if you request an export at a time when many other clients are requesting exports (for example, at the beginning of the month), your export will take longer to generate. When you return to the exports page after receiving the email that your export is ready, the export will be found on the right hand side of the screen as below. Click on the download you would like to open. When it opens, you will see you have received several different files, as shown below. This is the most often referred to call report export file, as it contains all the data collected for every call report submitted in the time frame indicated for the call report export. This file has a column for every field in the call report, both “standard” iCarol fields, and custom categories, groups and fields. Some highlights of this export are outlined below. Column C, LinkedToCallReportNum, will only have data in it if you are using embedded call reports. Embedded call reports are call reports that are related to each other. 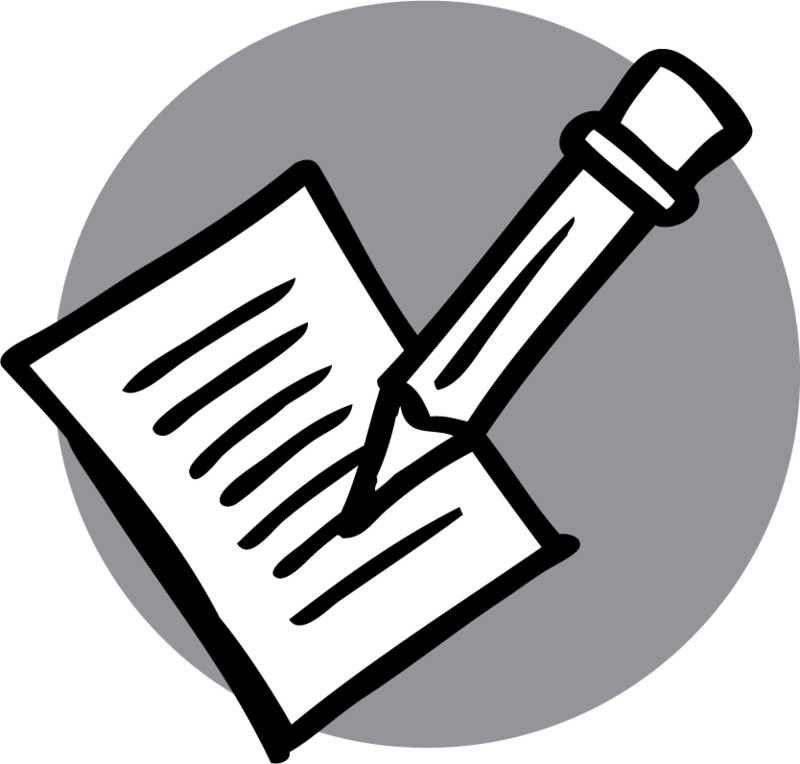 Many clients embed separate risk assessments to call reports, and other clients embed follow-up forms, for example. If there is an embedded call report linked to the call report shown in the row in the export, the call report number of the linked call report will be noted in this column. Column G, CallerNum, will only show something different than -1 if a caller profile was chosen for the call report. iCarol gives a number to all caller profiles which will be noted in this column. Column K, PhoneWorkerNum, will show the number iCarol assigned to each of your users. Columns M through R refer to an old way of tracking non-transactional calls that we are not using for newer clients. Older clients may still be using this tool, which places a horizontal list of checkboxes just below the Contact Information section at the top of the call report, as shown below. If you are not using this tool, you will always see Yes in column M, and No in columns N-R. If you are using this tool, No will be shown in Column M if Yes is shown in in one of the columns N through R, indicating that the call was a hangup, obscene, prank, wrong number, or silent call. Columns U-AA indicate the caller’s location as noted in the location fields in the Contact Information section (shown in the screenshot above). Each iCarol client can determine which of these location fields appear; some clients choose to turn some or all of these location fields off. Even if these fields are turned off in all your call reports, these columns will still appear in the export, they will just be blank. Columns AF-AP all refer to fields in the Contact Information section of the call report. Again, some clients choose to turn some or all of these fields off. Even if they are turned off, they will still appear in the export, but will be blank. Column AQ is first default text field on the Content Tab of the call report. By default, this field is called “Call Description”, though this name can be changed. Column AR is the “Worker’s Comments” text field on the Content tab. This field can be turned off; even if it is turned off, this column will still show on the export, but will be blank. Column AS is the “Feedback from supervisors and staff” text field on the Content tab. This field, and therefore, the feedback function, can be turned off but again, the column will still appear in the call report export. Column AT is the “Caller’s Feedback” text field on the Content tab. This field can be turned off but again, the column will still appear in the call report export. Columns AU-BC are additional text fields that can be added to the Content tab. These additional text fields are added via the “Overall settings for this call report form” page when editing call reports using the call report editor. Again, even if these additional fields are not used, they will appear in the call report export. Column BD will contain a number other than -1 if the worker who entered the call report is not a deleted user. iCarol assigns a Worker Number to all users in your system. Column BH refers to the “reviewed for accuracy” function that clients can turn on via the Calls tab in Admin Tools. Columns BI-BK refers to the feedback function in iCarol. If feedback is being given on call reports, there will be data in these columns. Column BL will show all the referrals given to the caller, both those found in the resource database and linked to the call report, and out of database referrals, if that functionality is turned on. Please note that if more than one referral was given, the referrals will be separated by semi-colons in this column of the export. Column BM refers specifically to instant messaging call reports where the IP address of the visitor is recorded in the call report. The custom categories and groups added to the call report begin at column BN. All columns before this point were “standard” iCarol fields, some of which can be turned off in the call report. All custom categories and groups, as stated earlier, are arranged alphabetically by Category name, then Group name. In the example call report export shown in the screenshot above, you can see the first 5 custom groups in the call report listed by their Category name, then Group name. The data you find in each row for these columns will indicate what Field was selected in the Group if it is a drop-down or checkbox Group, or what text was entered if the Group is formatted as a text Group. This report shows the selections made in custom categories, groups and fields for all call reports submitted in the time frame of your export. Each block of color in the screenshot above represents one call report, as indicated by the call report number in column A. Please note that column F is labeled “SubCategoryName” which is also known as the Group, and column G is labeled “Answer”, also known as the Field. If a Group is formatted as text, the text entered into that group will be shown in column I. This file will show follow-up activities created or edited during the time frame of the call report export. Please note, a follow-up activity created outside of the time frame indicated will not be included in this file, but if that same activity was edited in the time frame, it will be shown in this file. The columns in this file refer to the fields found in the “Schedule a Follow-up activity section” on the Finish tab of call reports. Each client can control which fields appear in this section via the Calls tab of Admin Tools. However, all of the columns will appear in the export even if you have turned off a specific field, they will just be blank. Please note columns J-L. These fields will be populated if the client has turned on, via the Calls tab in Admin Tools, the function to note follow-ups with a purpose (assistance, advocacy or survey). If this function is turned on, the follow-up purpose will be selected from a drop-down menu that will appear at the top of the “Schedule a Follow-up activity” section. This very small export (only 2 columns of data) only applies to those clients using embedded call reports. As noted earlier, embedded call reports are a way to link two different call reports together. Two common ways this is being used is for separate risk assessment call reports, and follow-up call reports. This report will show the call report numbers of those call reports that are linked together, or related. For those clients using the Out of Database Referrals functionality, this file will contain the details of the out of database referrals made during the time frame of the export. Any details of the resource that the call taker included (Agency name, Program name, phone number, address, website, etc.) will be shown in this file. The files are exported in .csv format, which can be displayed by Microsoft Excel. It is highly recommended that one have some knowledge of how to use Excel and its various functions to aid in analysing the data in the export files. There are many books, websites and courses that can teach one to use Excel. One particularly helpful function is filtering. Using filtering, one can find very specific call reports. For example, you could use filtering to find all call reports from male callers (assuming, of course, that the gender of the caller is recorded in the call report). You can add an unlimited amount of filters to find increasingly specific call reports, such as male callers over the age of 60 who lives in Beverly Hills and discussed physical health concerns during their call. In some cases, the particular data you might like to analyse will be contained in separate export files. For example, details on follow-ups are not contained in the same file as selections made in custom Groups. In this case, learning how to create pivot tables in Excel is very useful. In this way, you can link two files together to get a full picture of the call itself and the follow-up. 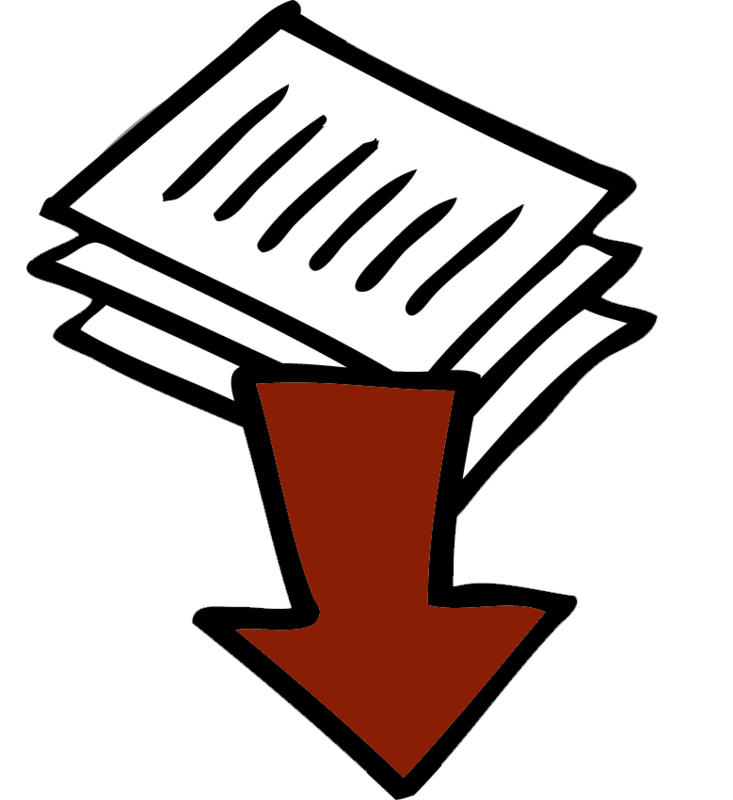 One last note – if you would like to save an export file to your hard drive, ensure you save it as an Excel file extension (.xlsx or .xls for example). New Call Report Form editing tool – Available now! Starting today, administrators have editing control over nearly all aspects of call report forms. You can add all new categories and sub-categories, and arrange them where you like. Create pop-out categories that only appear when a certain field is chosen on the form. Add new options to your check box and drop down lists, custom order them, and remove options you no longer wish to appear. These tools and more are now at your disposal, giving you more control than ever before. In the time it would have taken to submit a request to make a change, you can now make that change yourself and see the results on your forms instantly. No more wondering what a change will look like — you can see it onscreen and adjust as needed. Administrators access this tool on the main calls page by clicking a new button called “Manage Call Report Forms” found near the “New Call Report” button. Controls are easy to use and straightforward, with help tips available throughout when you hover over the different controls. We want to make sure you understand how to use these tools, and so our team has prepared lots of resources for you to use. To get the most out of this new tool, we strongly suggest you read our a downloadable user guide you’ll find after you click the Manage Call Report Forms button, when editing one of your forms. We’ve also added nearly two dozen focused Help Articles located in the Help section. And, beginning with the release of iCarol version 2.25 scheduled for release on Friday, there will be many help videos to watch as well. 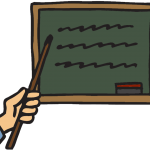 Prefer to learn via webinar? We’ll have several available, the first of which is happening this Thursday at 3pm EST. Find out more about what we’ll present and sign up for the time most convenient for you here. We sure hope you love these new controls and capabilities, and that you’ll find value in being able to make these additions and changes without needing to submit support cases. One of the greatest benefits of using iCarol is the ability to collect important data from the interactions you have with clients. Whether those interactions take place over the phone, via live chat or texting, or even in person, iCarol helpline software helps you collect exactly what you need using our customizable Call Report forms. For awhile now, those with Administrator security permissions have had access to some tools that let them make some small changes. For example, they can change the name of a category or sub-category. They can also add items to a drop-down or check box list, and deactivate items that they no longer wish to appear. But we understand that many of our users have been eager to control and change even more on their own, without needing to contact our support team. This year our team spent a lot of time planning and mapping out how to give you more controls over Call Report form editing, and we’re excited to say that next week we plan to deploy a new tool which will greatly expand your options, so you, as an Administrator, will be able to edit nearly every aspect of your forms. Add, move, and deactivate categories, groups, and fields. See the impact of rearranging items in real time. Set up your own if-then field relationships. What will this mean to you? Well, in the time it takes to submit a support request to our support team, you’ll be able to make your own changes. If you need to make timely changes, or changes that need to occur on a weekend or holiday, you’ll now be able to make those changes at those exact times since you directly control them. No more lag time between when you want it and when it’s complete, and no more wondering how it might look. We’ll of course offer short video tutorials and help articles to help you get the most from this new tool. Watch our blog and dashboard for more details, and the launch announcement, next week. If you use the “AIRS Problems / Needs” categories, there will be a small change to them coming with our next update of the taxonomy. AIRS announced they are splitting “Housing and Utility Assistance” into two separate categories: “Housing” and “Utilities”. When you subscribe to the 211 Taxonomy in iCarol, you get the benefit of automatic updates and maintenance to the taxonomy about once per quarter, helping you stay current and meeting AIRS accreditation standards. Our next taxonomy update will be in early October 2014 so when that is completed, you’ll see this new Problems/Needs category change reflected in your iCarol system. 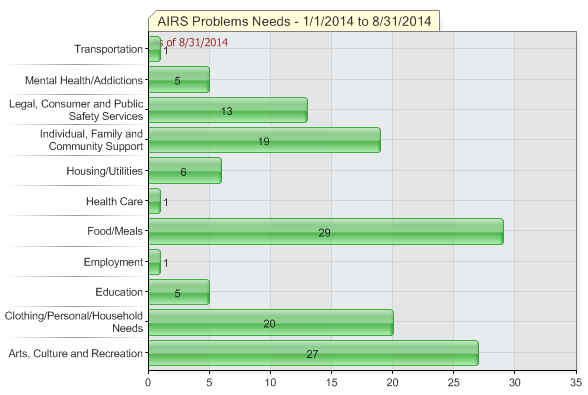 Once the change is in place, you can continue using any number of statistical reports on Problems/Needs to track and report on these issues, like this one showing the Problem/Needs categories with the current category breakdowns. Our Taxonomy updates take care of things like adding new codes or replacing codes that have been retired by AIRS. With the October update we will apply the changes to the needs categories, and we’ll automatically and retroactively place previously collected needs into the new appropriate categories, making your annual reports fall in line with what is being requested by AIRS. If you’re a current iCarol user and have questions about what it means to use Taxonomy in iCarol, check out our videos found in the ‘Help’ section of your iCarol system. If you have questions or want to add Taxonomy to your iCarol system, log a case with us and we’ll be happy to work with you!